Our objective in putting on this race is to help raise community awareness among Akumal Pueblo residents about this disease and to raise funds to help support women who have breast cancer. The race will take place in Akumal and men and women will compete separately. 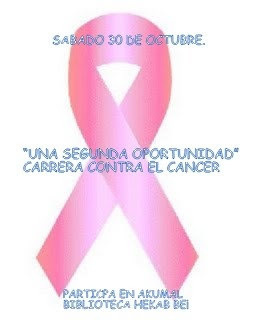 Participants will be asked to pay a small fee to participate in the race to help raise funds and in return they will receive a certificate of participation, a t-shirt and some information on how to prevent breast cancer by conducting monthly self-exams. For the winners we would like to provide prizes, if possible for 1st, 2nd and 3rd place in each group (men and women) as a further incentive to pariticpate. We are writing to ask if your business would be willing to contribute a donation towards the prizes, either in cash or in kind (such as a gift certificate to your business). We hope you will support this effort to help raise health awareness in the Akumal community to support us in helping to fight against cancer!